It's just something that make me feel so happy. I'm a fairly healthy person, as you may have noticed from past recipes and meals on my phone. 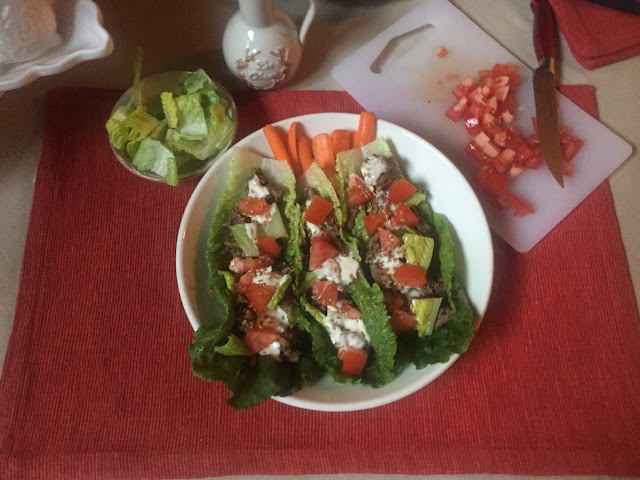 I love salads and any variation of salads but these Lettuce Taco Boats were totally awesome, easy to put together and you don't need to use a fork to eat it! Optional: Baby Carrots as a side! Super easy, friends! Cook ground beef on your stove top with whatever seasonings you like. I love chili powder, Italian seasoning, pepper and just a little bit of red pepper flakes. Once cooked to your beef liking (medium well, anyone? ), set up your 3 leaves on your plate and add some of your beef on top. While the beef was cooking, I chopped up some extra lettuce and my very ripe tomato. After adding the beef to my "boats" I topped them with the little bit of extra lettuce, tomato, flax seeds and dressing. Add some carrots and you're got a fine looking meal! It's nice to slow down every so often, right?